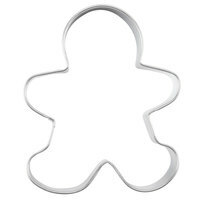 Celebrate the holidays by making festive cookies at your bakery, cafe, restaurant, or catered event with this Wilton 2308-1002 3 1/2" metal gingerbread man cookie cutter. This 1" deep, durable metal tool cuts through thick dough without bending or breaking. One side of the cutter features smooth, rounded edges, enabling you to comfortably press the cutter into dough. Dishwasher safe, this cutter can be repeatedly cleaned for frequent and sanitary usage. I absolutely love this cookie cutter for the holidays. It has held up really well and releases perfectly from the dough with almost no flouring. Whether you're making gingerbread cookies or just plain decorated shortbread cookies, this cookie cutter will make your life so much easier. It is very durable and sturdy. The perfect size for a gingerbread man. It’s not too small or large. It works well to cut through dough. Nice and lightweight and sleek edges. I can't get enough of how cute this gingerbread man cutter is. And, the best part is that the arms are legs and a big fat so they come out of the cutter clean and have ample room for decorating on. This product is amazing makes the perfect gingerbread men for Christmas it even for my son’s Boy Scout group he loves it that they can all decorate little you know cookies of them. We can't seem to have enough of these on hand in December. These hold up well and take a lot of washings to get rusty unlike some other cookie cutters. Great metal cookie cutter; easy to use on any dough type. The final product was great and easy to decorate. Great for baby shower reveals. This is a nice metal gingerbread man cookie cutter. The bottom cutting edge is a single layer of metal that cuts through dough easily, and the top edge is rolled over to be comfortable and safe for you to press down on with your hand. The metal itself is a natural metal finish, and should hold up for a long time. Some would think this would only be used around the Christmas Holidays but we incorporated this cutter for Voodoo Halloween Cookies that turned out amazing this past Halloween. The cutter was sturdy and didn't bend like a lot of metal cutters and delivered sharp clean cuts into the dough. Wilton's stainless steel Ginger bread cookie cutters are adorable. I can't wait to get started baking this year for Christmas. My kids will definitely have a good time making cookies for Santa! This is perfect for making little gingerbread men cookies at the holidays! It is nice and sharp but not sharp enough I’d worry about getting cut. This Metal Gingerbread Man Cookie Cutter is such a cute shape for your christmas cookies. It has a great sharp edge so when you're cutting cookie dough, so the shape comes out perfectly. When the holidays approach it is always good to have a gingerbread man cookie in stock. This metal gingerbread man cookie cutter is constructed of stainless steel making it very durable. The cookie cutter is also dishwasher safe making cleanup a breeze and easier on your team. Well made, and sharp enough to cut through chilled dough without warping. I use it for traditional gingerbread men and also skeletons for my towns Day of the Dead festival. This cutter makes cookies a lot more fun and it's a big hit with the kids. Works as a Gingerbread Woman cookie cutter as well. This is a perfect size stainless steel cookie cutter. The edges are sharp and cuts through dough with no problem, creating perfectly uniform cookies every time. The Wilton metal cookie cutter makes life easier on myself and kids. It creates a fun way to interact and cuts cookie dough with precision. This Wilton three and a half inch metal gingerbread man cookie cutter is pretty cool. It fits in any sized hand and does not feel slippery like other brands. I would highly recommend this cutter and would really like to see additional sizes and shapes in the future. Well done!! Catch me if you can, I'm the Gingerbread man! Wilton makes a great product, and this has remained sharp for months of heavy use. I'll be adding all of their other shapes next! This cookie cutter is very sturdy and cuts sharp and easily. I like the satin stainless steel on this, it looks and cleans much better than the shiny stainless. The Wilton 2308-1002 3 1/2" Metal Gingerbread Man Cookie Cutter met my expectations. The quality is great and the price is as well. Definitely recommend! I absolutely love this product! This Wilton metal gingerbread man cookie cutter works great! This cutter is 3 1/2" long. It makes a perfect size cookie to decorate! This is the quintessential cookie shape. It's perfectly portioned for single serving eating. I find that it holds up well underneath many different kinds of duress. A Gingerbread Man cookie cutter is perfect for the holidays, but I have found people love this shape all year round. This is a great price for a single cookie cutter, and one that every baker should have in their collection. I use it to cut gingerbread dough and sugar cookie dough. Wilton metal cutters work well! This a nice sturdy cookie cutter. It is also a nice medium size which I thought was great. We have not had any problems with the metal getting bent or mis-shapen at all which was one of my concerns. The classic gingerbread man cookie is a staple in any bakery. We use this cutter to create them. It's simple, but cuts the dough easily and is made of high quality material. Get a few of these and keep up with demand. How cute is this gingerbread man cookie cutter! I use it around Christmas AND halloween! You can make zombie cookies and they're always a hit with the kids. Wilton brand is the best. This is the perfect averaged sized gingerbread cookie cutter. It cuts and washes clean easily. I would have taken a picture but they were too quickly eaten, next time I guess. It's a well made product and am happy to have added it to my collection. I'll next be purchasing the gingerbread family cookie cutters. Finally got my gingerbread man cookie cutter! Surprisingly they are harder to find than one would think. The actual cutter itself is a little fragile but works well when cutting cookies. This gingerbread man cookie cutter is reserved for the holidays but when it is used it's used heavily. It always provides a consistent cookie and cuts very smoothly. The "arms" also aren't too narrow which can sometimes results in the cookie dough breaking when you remove it from the cutter,. It's nice that it's dishwasher safe. Wilton makes a pretty good cookie cutter. It could be a little thicker metal, but overall its a good cutter. The sizing is right for a typical gingerbread man. Can't beat it for the price! This is a valuable tool for our business. It's sturdy and doesn't bend. It's easy to clean and dries quickly. It also gives every cookies sharp edges and they bake up beautifully! A fraction of price than what you need to pay in other retailers. Versatile shape and cookies cut clean. I like big cookies, so it is a perfect size for me. A workable cookie cutter, that for the price was a great deal. The children loved using this cutter in class but it does lack extra support that can increase durability and life. Makes the right size cookies. Easy to use and easy to clean. Just make sure you put the cutter in the flour, then use it to cut the cookies so the it doesn't stick to the batter. This cookie cutter is not as sturdy as the copper ones but it definitely does the job and is a great price! I flour the bottom first! The Wilton gingerbread man cookie cutter makes great cookies, good size and easy to work with. I find that the quality on Wilton products is usually very good. I have several Wilton cookie cutters and will purchase more in the future. Great Quality Cookie Cutter. It DOES have Rolled Edges on the top. (unlike a lot of cheaper quality Cookie Cutters). Cuts clean lines, and no issues with sticking. This is a Wilton Brand Cookie Cutter. This is a very cute cookie cutter shape. This gingerbread man is perfect for the holidays. Good size, and has enough room to decorate easily. Made a great sized cookie! We were able to have large enough cookies to sell by singles, yet make a lot from our dough to get all cut and decorated in bulk. This cookie cutter worked perfectly for me during the holidays for cookie orders. For the price, you won't get a better quality instrument like it. Great for the season , i bought 2 , my neices and me had a bunch of fun decorating the cookies , my only concerne is the material , it's very easily bent. First, I'd like to thank the Customer Service reps for getting me a new cutter when the first one I ordered got bent up during shipping. This is the perfect size cutter for holiday cookies. My granddaughter can easily decorate them. It is a sturdy cutter and will last many years. Highly recommend. An excellent cutter, effortlessly cuts through dough and makes a nice gingerbread man figure. I will say however that when you bake the cookies, the edges of the cookies round off somewhat. A great sturdy cutter. Easily cuts through both sugar cookie and gingerbread dough leaving clean edges. This cutter is extremely durable and should last through many holiday seasons. This gingerbread man is a great hit at Christmas time. We always have the little kids help cut out their own little gingerbread men and they really enjoy doing it with this cutter. Very durable gingerbread man cookie cutter. Large in size, but it makes it easier to cut the cookie. The children love the size of the cookies, just as much as we do! This gingerbread man cutter is very sturdy for it's large size. Easy to use holds it's shape while cutting out the cookie. It really makes a statement to see the faces of kids when you give them an 8" Gingerbread Man !